Since the start of May, we’ve been traveling a lot. The Death to the Stock Photo city roadtrips led to me visiting my family which led to our trip to the beach which led to a few days in Chicago for a client project which led to Cincinnati for Beyonce (yes, she and Jay were amazing). It’s insane that I never got sick during the last two months because I used to ALWAYS get sick when I would travel. Despite the airports, cabin pressure, being around so many people + lack of sleep…I finally figured out that it was all tied to diet. When I feed my body crap, things don’t go so well. For most of my life I struggled with multiple sinus infections per year, rounds of antibiotics, migraines, feeling bloated, always fatigued + more that would be TMI. I always enjoy sharing things that have worked for me or ways in which I’ve improved my quality of life in hopes that at least one of you out there can relate and might give it a try. Below I’ve outlined tips, products + advice that might help you eat a bit more clean no matter where you jet off to next! Or maybe you don’t care and you want to skip down to the end where I’m giving away $100 worth of goods from UncommonGoods to help you travel a bit healthier next time…. Be Prepared (now I’m singing the song from Lion King): I don’t know about you but I’m always awake at like 3am the night before I leave for a trip and haven’t even packed yet. I used to procrastinate with packing my food too but not anymore! Honestly, Amazon is amazing. I order all the necessities a few days before I leave and it arrives on my doorstep! No need to look like a zombie walking through the 24-Hour Kroger two hours before my flight. Avoid White Crap. I’m guten-free (and have been since Feb 2012!) but I also avoid sugar and grains too. While I’m traveling I also try to avoid potatoes, cheese + cow’s milk. I still eat all of these things occasionally but I have to bring my A-game while I travel. It’s not the diet for everyone but it’s perfect for me. I’m not Paleo but food that is Paleo is real food so I don’t hate! Only Pack What You Love. If you hate kale like me then don’t lie to yourself and pack a crap ton of kale chips thinking you’re going to “eat healthy” on vacation. PUHHHLEASE. Pack what you actually like eating (or alternatives to the crappy stuff you crave). So for me? I pack plantain chips because at any moment I want to be able to eat guac and salsa. I also love these specific ones because the bags are small enough for me to bring them without busting out a huge, family-sized bag of chips in a restaurant. Be Strategic About Meals. I’m not a morning person so you definitely won’t see me up and ready for breakfast in the AM. Since I know this about myself, I know that whatever I pack should probably cover a late breakfast of sorts. I usually turn to homemade granola, Lara Bars or (if I have access to a kitchen), I’ll bring or buy stuff for a smoothie. Then I just need to plan specifically around lunch + dinner day-to-day. Those are the meals that are usually more social anyways. Snag + Pack Foods That Travel Well. 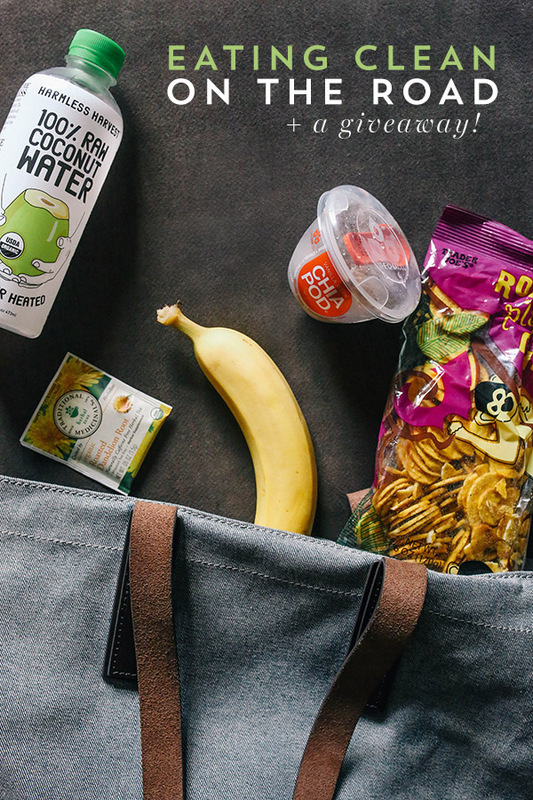 Unless you have a refrigerator built into your backpack (um, I need that) then you need to be on the look out for foods that travel well. On my list: avocados, bananas, bars + granola, crackers. Don’t Let Yourself Get Hangry. If I make sure I have an adequate amount of snacks available and don’t let myself get hungry angry then I won’t get lazy and eat crap at a restaurant. When I get to that stage of feeling hungry, I will let my guard down and then I’ll find myself on the toilet. Lovely. Hamilton Beach blender (small but blends ice + frozen fruit). On vacation I just kept peanut butter, spinach, almond milk and bananas on hand for a breakfast smoothie! Containers to store food if we’re just out for the day, want to store my grain-free bread and stuff like that. My water bottle! I drink so much water during the day so it made sense that when I would travel I would get dehydrated. Portable phone chargers. This is huge. I use Yelp to search “gluten-free” or “Paleo” when trying to find restaurants. I use an app to create white noise so I can sleep and well…Instagram. Now let’s get to the FUN stuff! A giveaway! 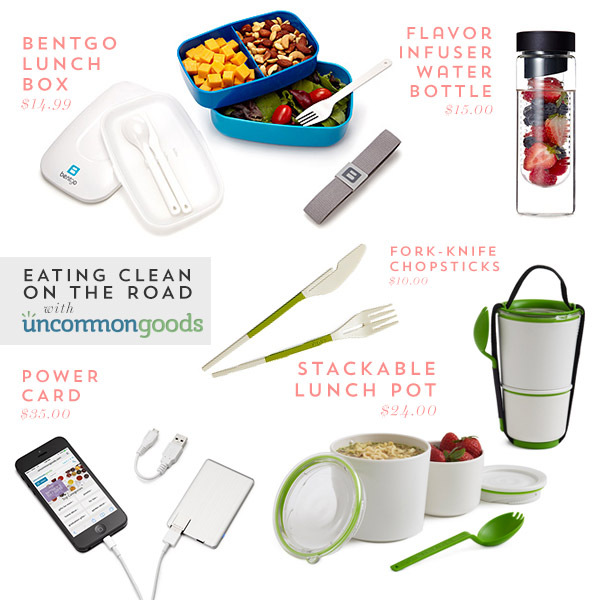 I’ve teamed up with UncommonGoods to giveaway some of my favorite items + things that will help you all feel a bit more prepared when trying to eat clean. After chatting with them, I started digging into all their other sections besides home & garden. If you’re in the market for some unique, handmade gifts then you should check out this stuff. I’m already planning on buying this donut pillow. If I can’t eat it, I might as well snuggle with it. Check out more home decor here. I’ve given you guys a lot of ways to enter and I’ll be choosing + announcing the winner on Friday on the 4th of July! I did not receive an compensation for writing this post. Just $100 worth of credit that I’m using on one of YOU all! Win all this stuff! Worth $100. Ohhh yeah. Loving this girl! So happy you are eating clean and not getting sick! Clean eating is always a challenge. Thanks for the tips. Great advice, especially “be strategic about meals” and “pack what you love.” Homemade instant oatmeal packs, dried fruit + nut mixes, and dark chocolate squares for dessert! As for what I love most about myself — killer willpower. What I love about myself: triumphing over the hard times in life has given me the experiences to share with others when they need to be lifted up! I love my sense of humor! With all the struggles of my recent diagnosis, I’m grateful that I can look on the bright side and keep myself laughing and smiling. This is so helpful. I finally just made the connectionthat I feel pretty crummy after traveling as well. One thing I love about myself is how confident I feel in a good pair of heels. ps. I love my positivity and eye color! I loved this! I’ll be sharing this with others. Great ideas! I’m glad I’m at a place in life where this applies not only to me but my kids – thanks! I love my capacity to support my loved ones. You absolutely want me cheering you on in a marathon because I’m really good at it. What I love about myself: I love that I am a caring and compassionate person, also I am really good at finding new music or just picking music to play when needed! thanks for this post! these are really great tips! i need to be better about my eating habits when traveling for sure. I love these tips. Traveling really can make it so much harder to stick to eating clean. If there’s one thing that I love about myself it’s that I can stay strong in most difficult situations that I’m faced with. Thank you for the tips! What I love about myself is my determination to achieve whatever I set my mind to. I love my hair and my legs. So awesome of you to share this! Great tips! I travel a lot, so this has been helpful! And these items would be awesome to travel with! What I love about myself – my smile. What I’m loving about myself right now — My commitment to feeding myself only the best foods, and the way exercise makes me feel. The combo of proper diet and exercise is amazing! I love the ability I’ve been given to provide for my family by doing something I love. Life is grand! Ohh such a timely post for me! I travel frequently for work and find that I’m stuck with crappy options for breakfast/lunch/dinner and either eat poorly or skip meals which is NO GOOD. I’m trying to get better about setting myself up for success when I’m outside of my normal routine so I don’t come home feeling guilty or sick. Awesome giveaway! I love my eyes. Oh my goodness…such good awareness of what works well for your body when traveling. I have just recently started to figure this out! Hmm, what do I love about myself? I love my body that works so well. It allows me to dance (not well, but that’s more of a practice thing than anything else), run, stretch, and do so many other things. I love doing things that I know will keep it in good working order (yes, I recently discovered my love of healthy eating and exercising, and I’m a bit addicted!). I’ve enjoyed learning about what my body likes and what fuels it. I wish you’d go into being gluten-free some more – I’ve just recently realized the effects gluten has been having on me and I’d love to learn more about it! Right now I love my growing belly! Being pregnant has totally amazed me in what our bodies are capable of! I love learning! Especially all the things I’ve been learning this past year about eating clean and healthy! I loved following your healthy travel eating on Instagram, especially since I just did a road trip myself. I found that having easy to grab healthy snacks made such a difference and eliminated any weakness for fast food. I love that I’m not afraid to take risks. It took a long time to get to this place but every risk has led to where I am today and what’s next! I love that I can use my words in a positive way. I find something so satisfying about seeing other people smile. I think the benefits show up emotionally and even physically! I love that I’ve started to take leaps of faith in my life. Everything in the past few years has been about taking huge leaps of faith and I can say now looking back that they were some of the best decisions I’ve made. ps..loved your tips for eating clean while traveling. My husband and I are traveling almost ever summer for the entire summer and multiple times throughout the year. I’ve fallen trap so many times to eating junk and then feeling like junk. I love that I recognize and am working on my flaws, to be a better wife and mother to my children. I also love that I – along with my family – have a great sense of adventure and are always exploring new places. We’re fixing to hit the road soon! My supportive and loving network of family and friends – without them, my life would lack so much. I love making friends by being myself. I love my wavy hair and green eyes. I love the big dreams that I have for my life. I’m taking small steps to reaching them right now. I also love my perseverance through tough times. What I love about myself is that I’m resourceful. When faced with a tough issue at work—whether it is building out a custom feature for a site or migrating from an unfamiliar CMS to WordPress, at the end of the day I find a way to make it happen. Hopefully this giveaway is open to Canadians… I’m taking a trip to Japan next April so those fork-knife chopsticks will be especially useful! I love my ability to not give up! I travel so much for work and am always looking for ways to eat better on the road – these tips are great! Great post! Such great tips and insights on traveling and eating healthy. What do I love about myself, that I am detail -oriented and an observer. Love that stackable lunch pot! Thanks for sharing. I love my hair and that it grows back so fast. #3 – so this! I always used to pack stuff I *should* eat and then I would run out of the 1-2 things I truly wanted.